ADlog reliably executes measurement tasks with an exactly predictable time reponse, the channels are acquired synchronously. Depending on your tasks intelligent, online adaptable pre-processing will be possible, e.g. filtering or transient functions. ADlog automatically and continuously measures sample rates of up to 4.8 MHz (e.g. 32 analog channels with 16 bit and 150 kHz each). ADlog displays the data in up to 8 diagram windows, which can be adjusted with zoom and monitoring of individual channels. 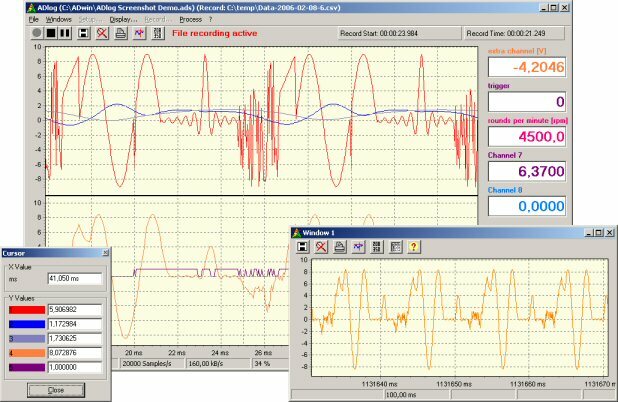 ADlog filters measurement channels, displays the data online and generates additional channels by combining several measurement channels. Limit values as well as pre- and post-trigger threshold values can be set according to your needs. All data can be written to your hard disk continuously even when the graphical display is stopped. ADlog is based on our approved ADwin systems, and tested thousand times in world-wide applications for fast measurements, open-loop and closed-loop control sequences.